It’s been a while since I posted about what Hailey has been up to. And these pictures are actually from quite a while ago. Anyway, as I always say- it’s time to catch up on my posts! Maybe this summer I really will get caught up. Hailey has been studying US Geography this year. 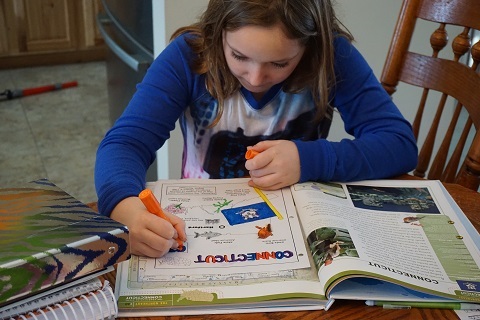 She started out using Road Trip USA but we have changed curriculum since then. 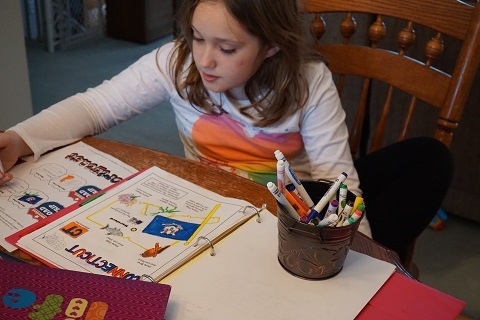 Hailey was working on part of the lapbook for Road Trip USA. We both really enjoyed the curriculum, but we stopped using it because it was a bit more involved than what I wanted to use right now. 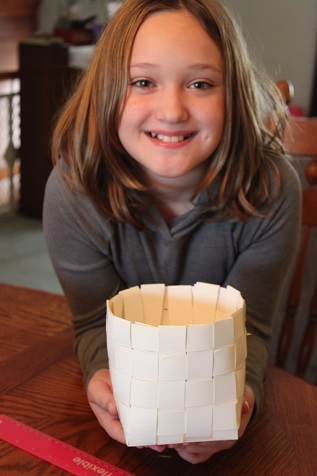 We have been studying US History this year and Hailey has completed a lot of fun projects to go along with our lessons. 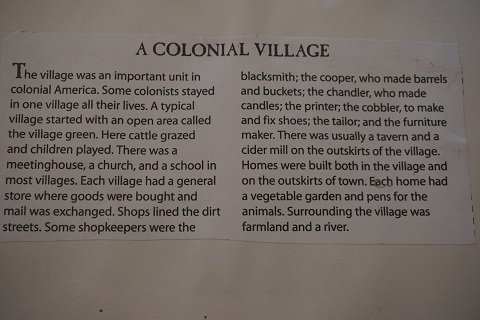 Hailey also learned what a typical colonial village was like. 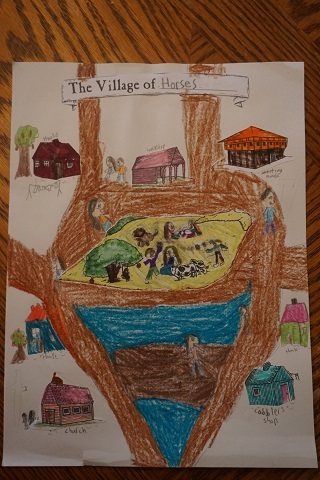 She drew a picture of what she thought represented a colonial village. I have lots more fun history activities coming up to share, so be sure to check back! Continuing along in our studies of American history we talked about the first English settlement in North America. Hailey learned it was on Roanoke Island (in 1587), which is off of the coast of what is now North Carolina. A group of colonists built forts and houses. The Croatan were a friendly Native American tribe about 50 miles from where the colonists settled. After they were there for about a month their leader, John White, left to go back to England for supplies. He left everyone behind, including his family. John White was not able to return until 1590. When he got back all of the colonists and their houses were gone. There was one clue, the word “Croatan” carved on a tree. No one has ever figured out what happened to the colonists. 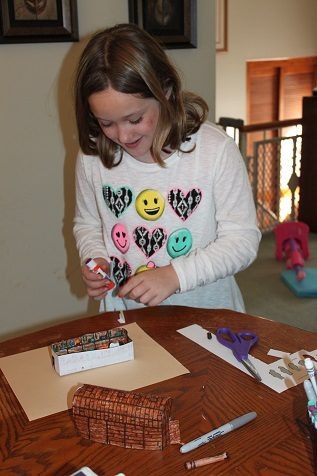 In this activity, Hailey made a mini-scroll book, from the Colonial America Easy Make and Learn Projects. 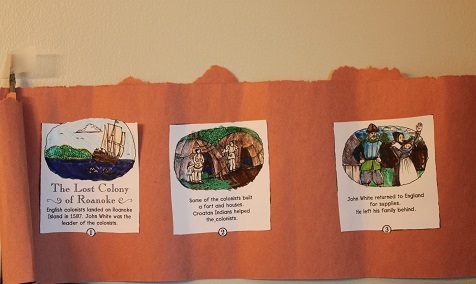 The first 3 pictures on her scroll depict what happened when the colonists arrived and when John White left. 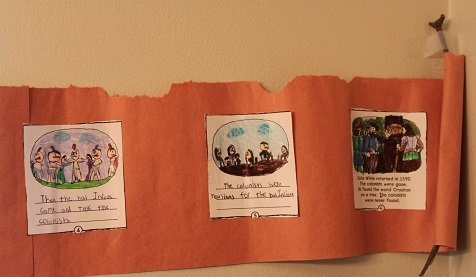 The fourth and fifth pictures Hailey drew and wrote about what she thought could have happened to the colonists. The last picture shows what happened when John White returned and found everything gone. Jumping ahead, we also talked about how different it was for the pilgrims when they arrived here in America. 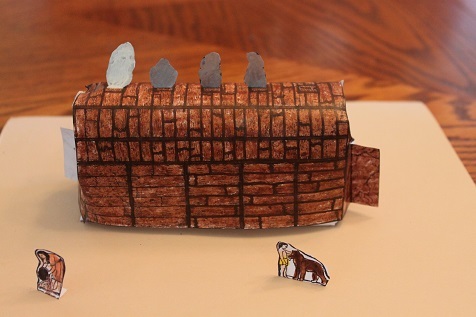 Using printables from The Pilgrims, the Mayflower and More Easy Make and Learn Projects, we learned that in the Old World (Holland) the pilgrims had houses to live in, shops to go to, roads, cities, and towns. When the arrived in the New World (America) what they found was very different. We talked about how hard it must have been, and if people would have made different choices had they known how hard it was going to be. 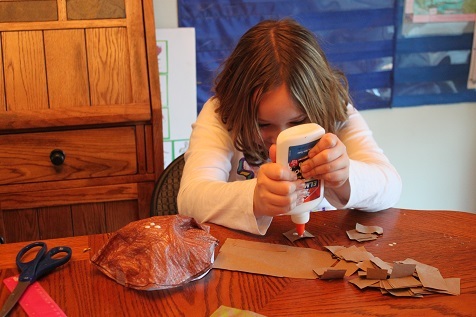 The hands on activities like these are what Hailey really enjoys doing! 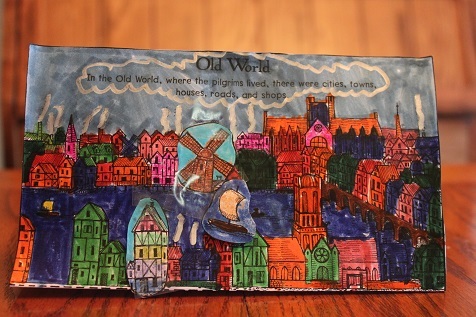 I find that she remember the material better when she has created something to go along with what we are learning about. 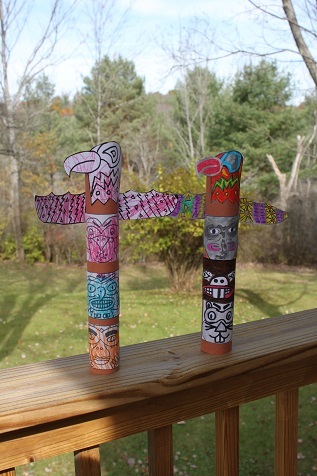 As we work along in our study of US history, we spent a lot of time learning about the Native Americans. We learned about some of the main tribes that were here in the US and where they were located. 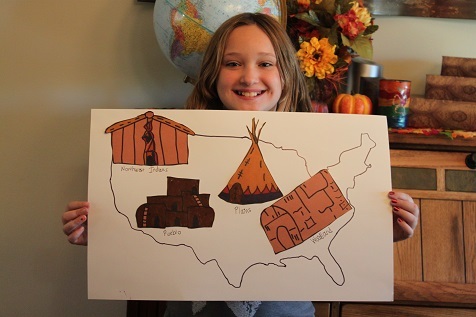 Hailey made different representations of the tribes and placed them on the map where they lived. 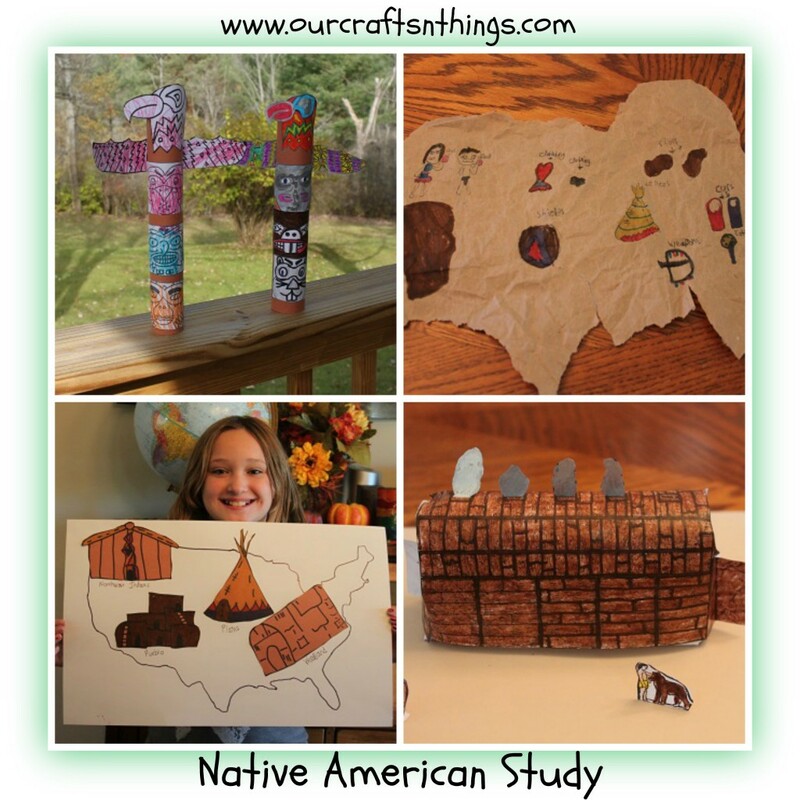 Then we did a more in depth study of each of the different groups of Native Americans. When we studied the Southwest Indians, Hailey weaved a basket. She decorated the basket after she finished weaving it, but apparently I didn’t take a picture of that. We learned how they weaved the baskets so tightly that they could even carry water in them. 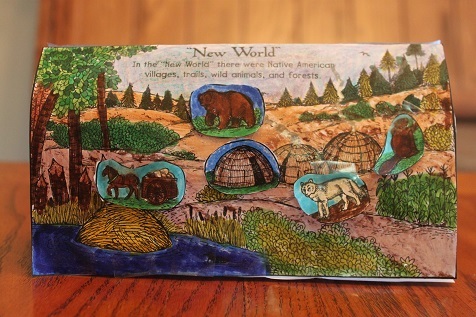 Hailey learned about how the Plains Indians hunted buffalo and then used every part of the buffalo for something, being sure not to waste anything. 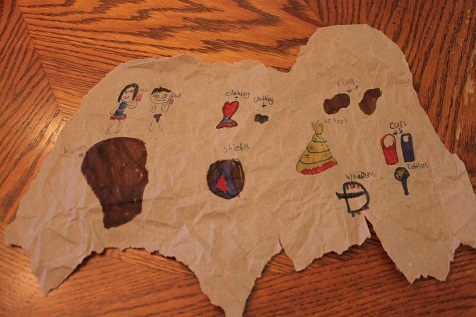 She made a “buffalo skin” and then drew pictures on it of the different things they used the parts of buffalo for. Next she learned about the Northeast and the Southeast Indians. She made a wigwam and we learned about who lived in the wigwams. 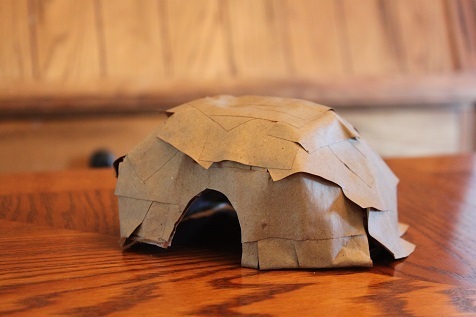 The Indians who lived in the wigwams would build a frame and cover it with bark and hides. When they moved, sometimes the wigwam would stay and sometimes they would roll up the covering and take it to the new location. 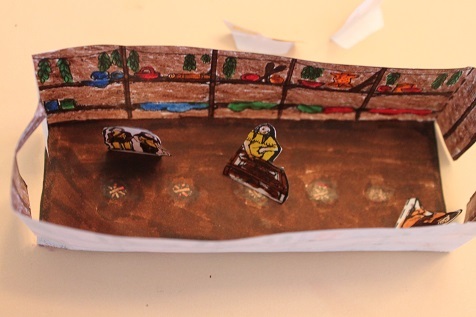 Another thing the Native Americans lived in was long houses, so Hailey made a representation of a long house. She learned how several families lived together in the long house. We both learned a lot and had fun too! Hailey is studying US history this year and we are both absolutely loving it! We are using Sonlight, and I have to say this is the first time I am not even considering switching curriculum. I love the books we read together and we have both learned so much! Since Sonlight does not offer a lot of hands on activities I do add those in, as Hailey loves doing those too. 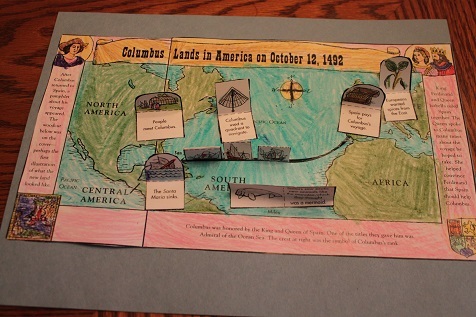 Back when we were learning about some of the explorers who came to America, we studied Christopher Columbus. 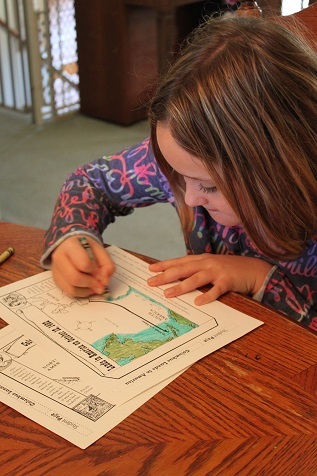 In addition to reading books about him, Hailey worked on a map that showed the route Columbus took when he landed in America. 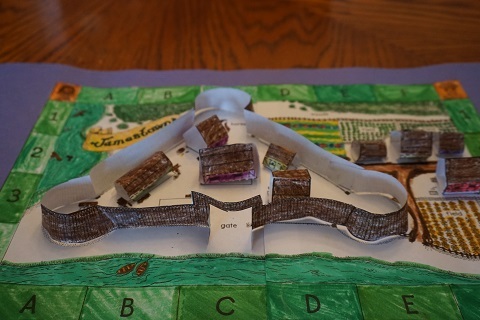 This is her completed map (from an activity book called Interactive 3-D Maps: American History).